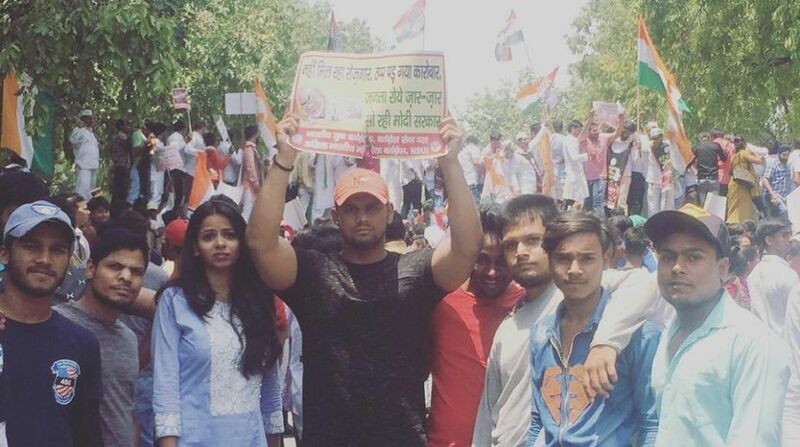 Police on Wednesday detained Indian Youth Congress protesters as they marched towards Parliament as a part of their “Bharat Bachao Jan Andolan” campaign to highlight the failures of NDA government on various fronts and fuel price rise. According to a Youth Congress statement, the march to Parliament House was stopped by Delhi Police personnel who used water cannon and lathicharge against the protesters. “Youth Congress President Keshav Chand Yadav and Vice President Srinivias B.V. were among the detained and taken to Parliament Street Police Station, along with thousands of activists,” it said. The statement said that Yadav and Srinivas were also manhandled by the police and were injured during the protest, along with several party office-bearers, state presidents and other activists. It said the Delhi Police reported that a total of 1,500-2,000 activists were detained during this protest out of 20,000 protesters who had gathered. Among the senior Congress leaders who joined the march were Pramod Tiwari, Avinash Pandey and Jitendra Singh. Under a nationwide call of “Bharat Bachao Jan Andolan”, the Youth Congress has launched a countrywide movement to expose failures of the current National Democratic Alliance (NDA) government. The campaign held the Narendra Modi government responsible for ill-planned and degenerating decisions being taken on issues relating to unemployment, inflation, farmers, Dalits, women atrocities, and ill-planned and mismanaged implementation of Goods and Services Tax.